The album cover for Love Lust Faith + Dreams was revealed last March 19 on the band’s social networks. It features “Isonicotinic Acid Ethyl Ester” (2010 - 2011) from internationally renowned artist Damien Hirst’s Spot Paintings series. A second Hirst work, which is from the Colour Charts series, will appear on the CD itself. Love Lust Faith + Dreams is the band’s fourth studio record. It follows This Is War, which was hailed as “an artistic triumph” by Alternative Press, “a shimmering epic” by MTV.com, and contained the No. 1 Modern Rock radio hits “This Is War” and “Kings and Queens.” During its two-year tour in support of This Is War, the band sold out arenas around the globe, playing over 311 shows in nearly 60 countries on six continents to three million people – and breaking the Guinness World Record® for the longest ever concert tour by a rock band. Artifact, a documentary about the band’s battle with its record label, has won the People’s Choice documentary award at the 2012 Toronto International Film Festival, the Audience Award at the 2012 Gotham Independent Film Awards and it was also an official selection of the 2013 SXSW film festival. 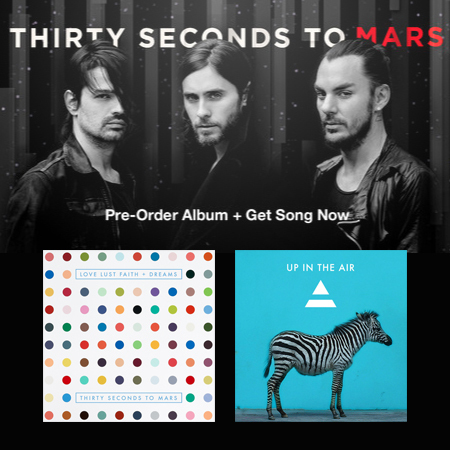 LOVE LUST FAITH + DREAMS, the new album from THIRTY SECONDS TO MARS is now available on your favorite record bars nationwide and online via iTunes Philippines under MCA Music Inc. in cooperation with SMART, Live More!